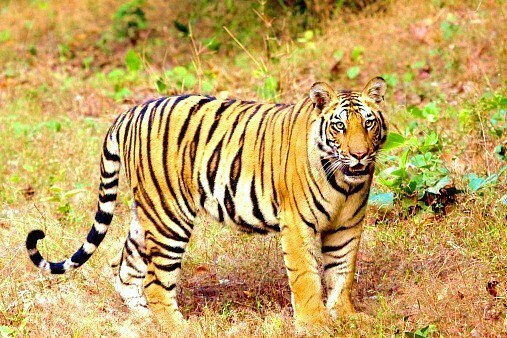 One of the largest of the 'big cats', the tiger is an instantly recognizable and emotive animal. Nine different subspecies are recognized, three of which became extinct in the latter part of the 20th century; the Bali (Panthera tigris balica), Javan (Panthera tigris sondaica) and Caspian tigers (Panthera tigris virgata). The remaining subspecies are the Siberian (Panthera tigris altaica), South China (Panthera tigris amoyensis), Sumatran (Panthera tigris sumatrae), Indochinese (Panthera tigris corbetti), Malayan (Panthera tigris jacksoni) and Bengal tigers (Panthera tigris tigris). The different subspecies vary in their body size, coat colour and markings, with the Sumatran tiger being the smallest and darkest, whilst the Siberian tiger is the largest and palest subspecies. Markings and coat colour can overlap between subspecies and are not often used to differentiate. Generally however, tigers have a reddish-orange to yellow-ochre coat with a white belly and black markings, the pattern of which is unique. Like the other big cats, tigers are well adapted for hunting large prey and have short, heavily-muscled forelimbs and long, sharp, retractable claws. Extreme colour varieties are occasionally seen in the wild, such as whitish-grey tigers with chocolate stripes which are the result of two tigers with a recessive gene breeding. However, whilst this colour variation is popular with zoos, it is not of conservation significance.